A young queen must become a warrior Pharaoh. 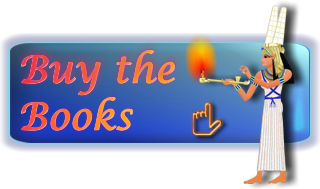 In the glittering but treacherous kingdom of the Pharaohs, young Queen Hatshepsut must become a warrior king or face the annihilation of her people. Freed from her incestuous marriage and enthroned as a god in her own right, Hatshepsut finds the whole world is opposed to a woman who rules over men. To prove her sanction by the gods, she risks her life and her crown by erecting a monument to rival the pyramids. On the brink of her triumph, a conspiracy plunges Egypt into rebellion. The struggle to save her nation throws Hatshepsut into epic battles, a race for hidden treasure and a heartbreaking betrayal that shatters the man she loves. 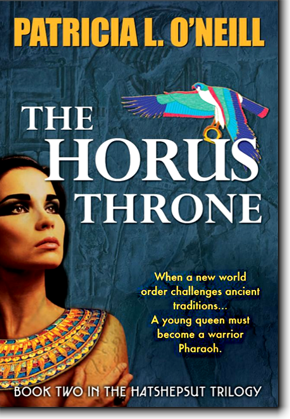 Based on actual historical events, The Horus Throne recreates the sensuous and savage story of ancient Egypt's brilliant female Pharaoh, Hatshepsut. Author Patricia L. O'Neill's groundbreaking research brings vivid life to the richly-drawn characters and their exotic world. The Horus Throne is book two of The Hatshepsut Trilogy: Her Majesty the King, The Horus Throne and The Eye of Re.